There’s nothing more enjoyable than seeing a major update come through for one of your favourite apps, recently the case with Byword. 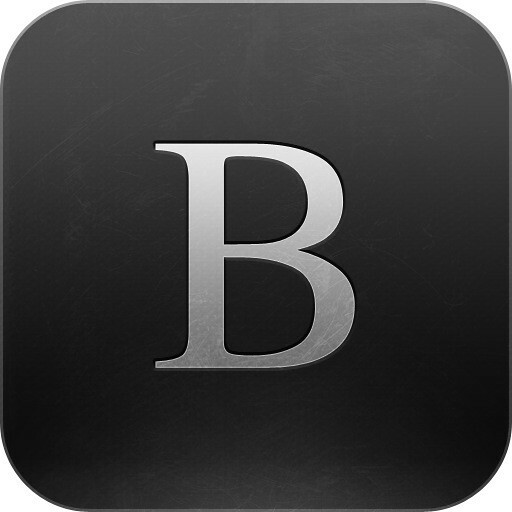 As stated by the developer, Byword is a simple and efficient text editor for the Mac, iPhone and iPad, allowing you to write, sync documents (Dropbox, iCloud), and now directly publish – one of the main changes in version 2.0. What follows below has a focus on iOS, which is where I exclusively use this app. 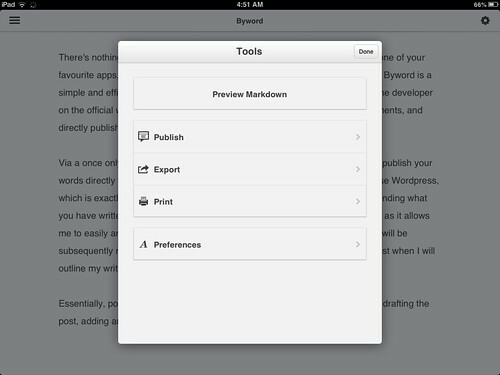 Via a once only in-app purchase of $5.49 (AUD) which enables the feature on both iPhone and iPad versions, Byword now has an option to publish your words directly to blogging platforms Tumblr, Blogger, Scriptogram, and of course WordPress, which is exactly how this article has been posted. 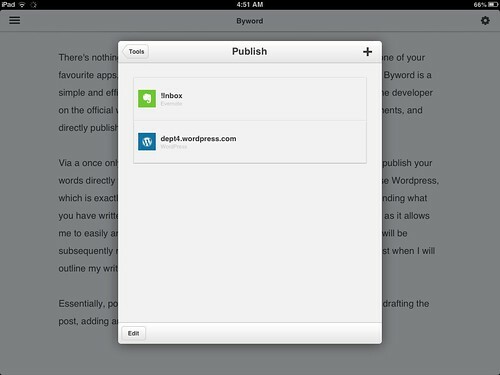 This feature also enables integration directly with the notebooks in your Evernote account. I particularly like this feature as it allows me to easily archive any posts (or drafts that may not have made the cut and will be subsequently reviewed) for later reference. 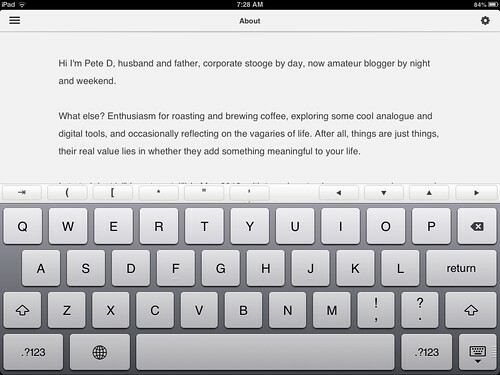 More about this in a future post when I will outline my writing and publishing workflow. 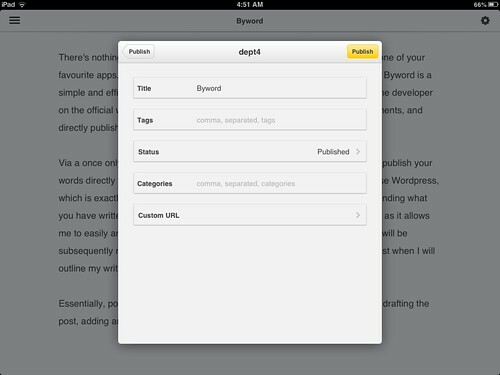 Essentially, posting an article to WordPress is now as simple as opening Byword, drafting the post, adding any required images or links, and choosing publish in settings. You will be asked which linked service you would like to publish to, and for WordPress, be given options for status, tags and categories which you may have set up on your site. The only downside is that the integration does not automatically populate categories or tags, you’ll need to remember what you have set up. Once done, I can then sit back and marvel at the eloquent prose I have unleashed into the world. Or, as reality would have it, see the dozen or so typographical and grammatical errors I had somehow missed in multiple proof reads, which must then be edited and reposted. Those not requiring post-publish editing have generally been proofread by the dept4 editorial team (wife and children). In what can only be described as a master stroke of irony, this paragraph had been written extolling the virtues of Byword’s syncing abilities, however a few seconds after the following screenshots were taken, choosing to accept the remote (iPhone) copy of this draft resulted in an unexpected shut down of Byword, leaving me with the local copy, containing none of my additions or edits made on this mornings bus commute. Though I cannot completely rule out user error, no incorrect tap should have caused a crash. Hopefully this was just an isolated event occurring on initial use of this feature, and I have subsequently added further text on my iPhone, iPad and iPhone again which have synced perfectly through Dropbox. I have also previously experienced robust syncing through iCloud. 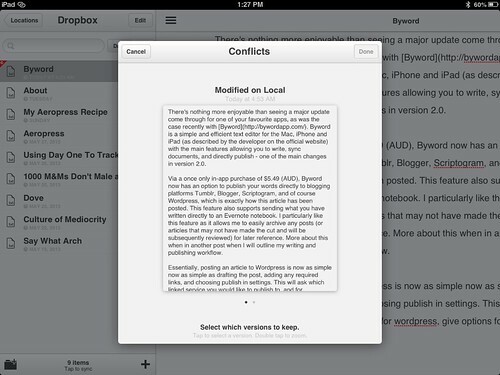 As I have noted above, and is seen in the screenshots below, a new syncing feature is the ability to preview version conflicts, allowing an informed decision about which to keep – a nice addition, as I will often start a post on my iPad, edit further on my iPhone, finalising the article when back on the iPad. Check out a great review (as usual) of this update by Federico Viticci at Macstories, and on a side note, I cannot wait for this.